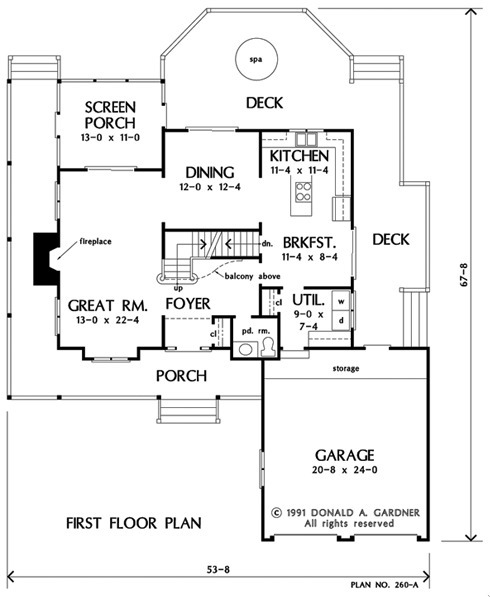 Windows and gables give a romantic feel to this farmhouse floor plan with wrap-around porch and expansive deck area. Visual excitement continues on the interior with a two-story foyer and upstairs balcony. The large great room with dramatic fireplace features a box bay window at one end and opens to a screened porch at the other. A center-island kitchen opens to the dining room and large breakfast area for a real country feel. 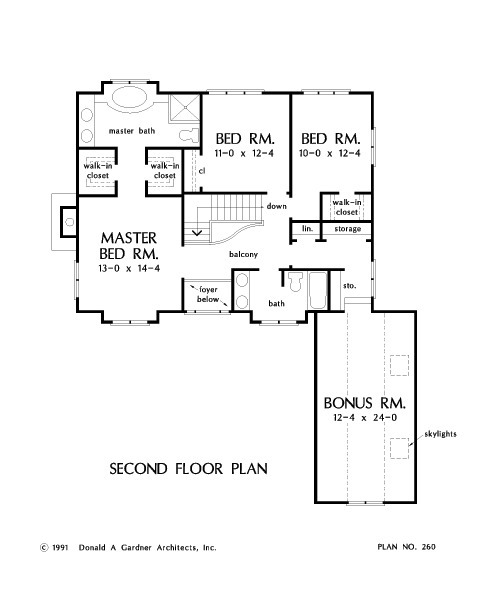 The master suite in this home plan has double walk-in closets plus whirlpool tub and shower. Access the skylit bonus room easily from the second floor through an additional storage area. 1st Floor: 1025 Sq. 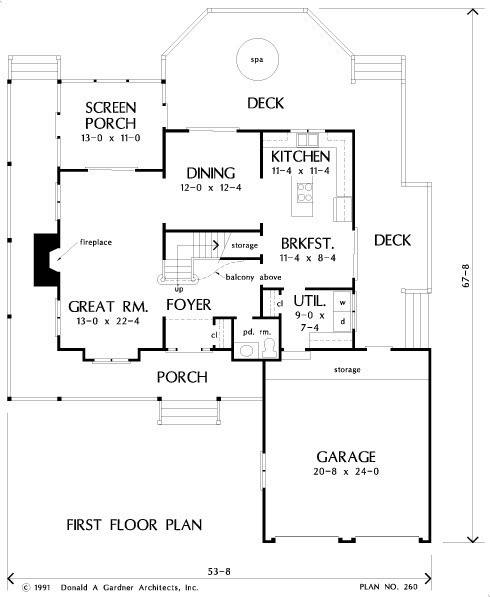 Ft.
House Dimensions: 53' 8" x 58' 8"
Great Room: 13' 0" x 22' 4"
Foyer (Vaulted): 6' 0" x 8' 0" x 17' 0"
Dining Room : 12' 0" x 12' 4" x 8' 0"
Great Room : 13' 0" x 22' 4" x 8' 0"
Kitchen : 11' 4" x 11' 4" x 8' 0"
Breakfast Room : 11' 4" x 8' 4" x 8' 0"
Utility Room : 9' 0" x 7' 4" x 8' 0"
Bonus Room (Vaulted): 12' 4" x 24' 0" x 8' 0"
Garage : 20' 8" x 24' 0" x 0' 0"
Master Bedroom : 13' 0" x 14' 4" x 8' 0"
Bedroom #3 : 10' 0" x 12' 4" x 8' 0"
Porch - Front : 30' 4" x 6' 4" x 0' 0"
Porch - Left : 6' 4" x 34' 4" x 0' 0"
Porch - Screen : 13' 0" x 11' 0" x 0' 0"
Deck / Patio : 24' 6" x 15' 4" x 0' 0"
Balcony : 13' 4" x 5' 0" x 8' 0"
Storage (Other) : 6' 6" x 2' 0" x 0' 0"
Storage (1st Fl.) (Sloped): 8' 8" x 3' 2" x 0' 0"
Storage (2nd Fl.) : 1' 10" x 5' 0" x 0' 0"